The First Presbyterian Church of Brooklyn has partnered with Key Food to help fulfill its “Mission Brooklyn” initiative. On Friday, March 1, from 7-8 p.m., locals may donate contributions and food items at the Key Food @ 102 Montague Street, to help restock FPC’s Food Pantry. After several months of increased need, the church’s pantry, which serves some 120 community members, is in dire need of restocking. Key Food is allowing FPC’s Mission Brooklyn—its monthly youth service initiative—to set up tables on March 1, during which shoppers can buy cans of food from the grocery that will be directly donated to the Food Pantry. Cash and check donations are also welcome and will be used to purchase food. 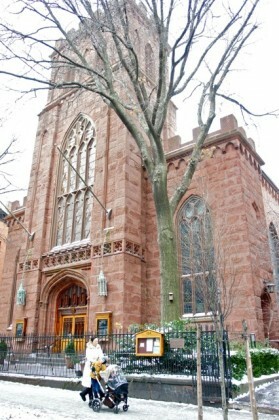 First Presbyterian is located at 124 Henry Street. Read more about the food pantry and its accomplishments and needs at its website. The Food Pantry is every Thursday at 10 a.m.